For 2014, this Ridgeville, South Carolina builder offers twenty-nine models from over fifteen to almost twenty-four feet in length in five series of Bay Reef, Center Console, Dual Console, Skiff, and one twenty-one foot Walk Around model. The 203 DFS is the mid-size of five Dual Console models ranging from eighteen to twenty-three feet. 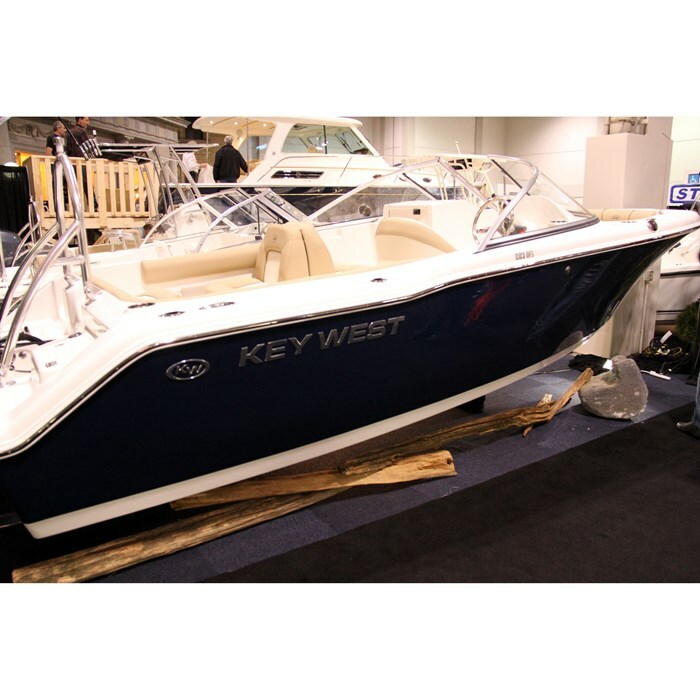 It is the only Dual Console model with the “FS” designation meaning, “Family Sportsman,” a relatively new emphasis for Key West Boats in which it recognizes a changing trend in boating to more family activities such as water sports and cruising and less importance in pure fishing activities. And this change in emphasis is certainly obvious in the “family activities” amenities present in the 203 DFS while still providing the fisherman with his or her required necessities. For example, seating in the 203 DFS is most certainly geared more toward family and watersports and cruising with a huge L-shaped lounge seat which stretches from immediately behind the driver’s swivel and adjustable bucket seat with flip-up bolster down the starboard side around and completely across the transom. With its full padded backrest, this lounge would comfortably seat four and even six if necessary. The backrest of the extreme portside end of this lounge at the transom hinges open providing easy access to the molded swim platform which itself features a recessed, folding, telescoping three-step stainless steel boarding ladder. The starboard side portion of the swim platform houses a molded-in, hinged-lid ice chest which of course could act as a cooler for beverages or for fish or perhaps even for both. Opposite the driver’s seat, more emphasis on family boating is evident in the standard back-to-back “sleeper” seat which can be folded flat into a sunlounge. This may be optionally replaced with an identical driver’s style bucket seat. Just ahead of this passenger seat in the passenger console is what Key West refers to as a “potty room,” or more commonly called a head compartment with a bi-fold acrylic entry door, molded sink with faucet, and room inside for an optional porta-potti. Ahead of the curved, full windshield with walk-thru opening centre section, the U-shaped bow seating is most family oriented with full cushions, surrounding padded backrest bolsters, recessed speakers for the standard MP3 port equipped standard stereo, and handy cupholders. Beneath the seats are storage compartments. A dedicated hinged-lid anchor locker is found right up front in the bow. 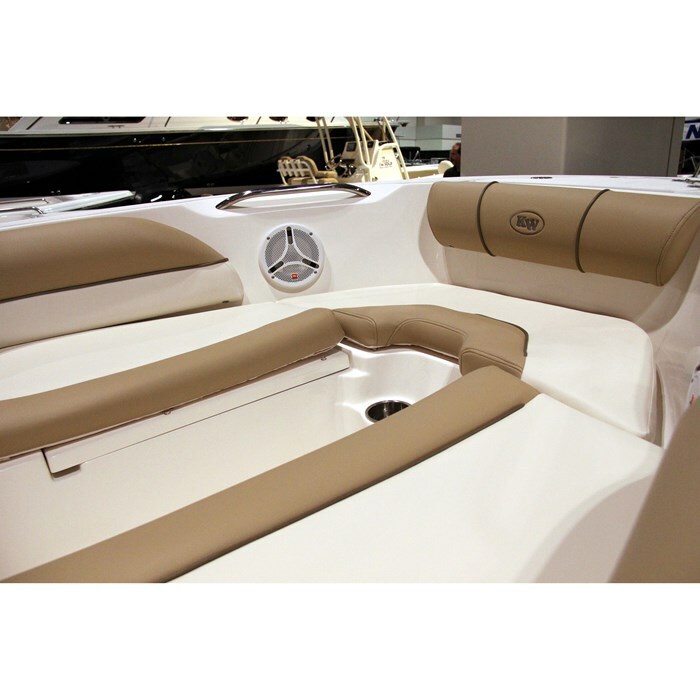 More storage is found within the driver’s helm console plus under the extreme portside transom section of the lounge seat. 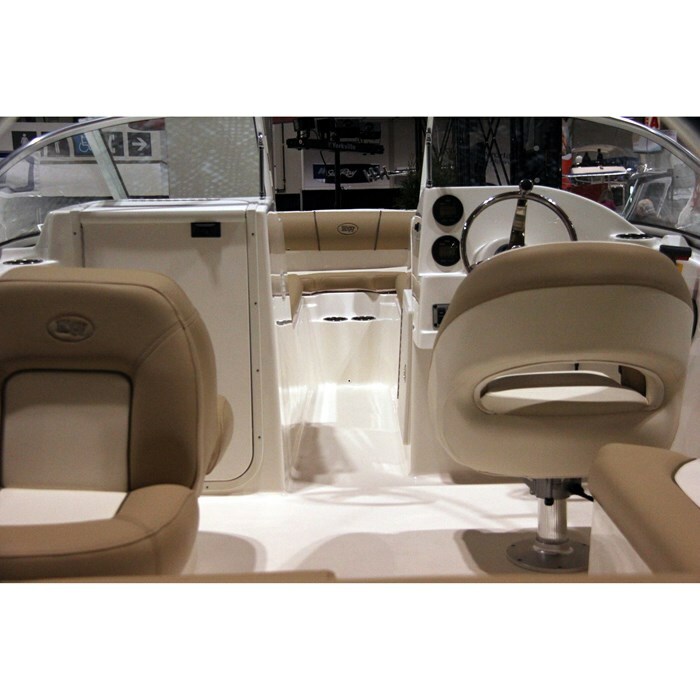 Under the centre section of this transom seat is a large recirculating livewell with a high speed pickup. 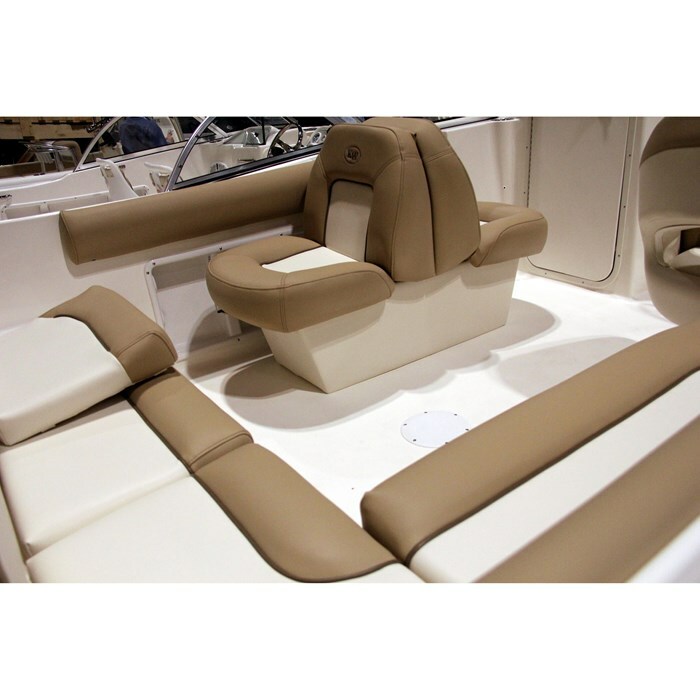 Beneath the entire starboard side of this lounge seat is storage of sufficient length to handle watersports accessories such as skis, wakeboards, etc. Other notable standard features of the 203 DFS include a molded, non-skid, self-draining inner cockpit liner, pull-up cleats, four stainless steel rod holders, both fresh water and raw water washdowns, horizontal gunwale rod storage, and Sea Star hydraulic steering. 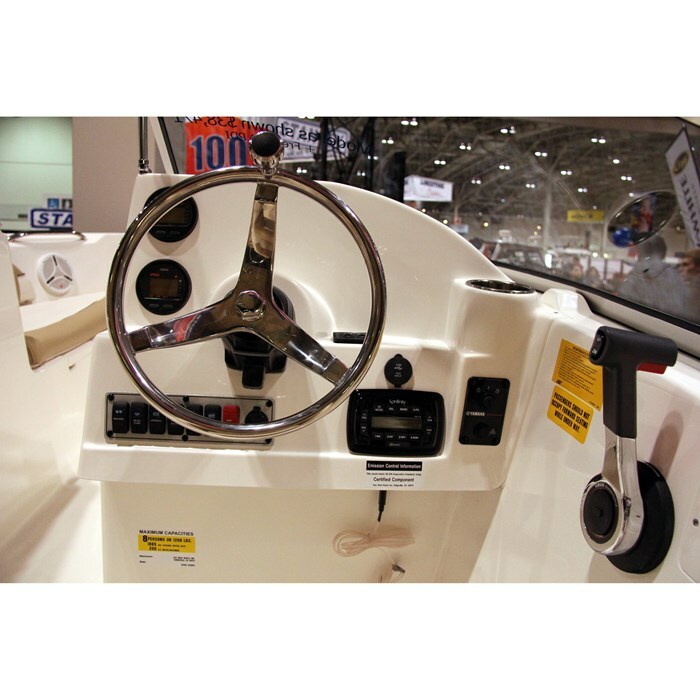 Notable available factory optional equipment includes trim tabs, tilt steering wheel, cockpit table, a choice of six hull colours, two available electronics selections, plus several canvas enclosure and cover options including a choice of aluminum or stainless steel bimini top supports. 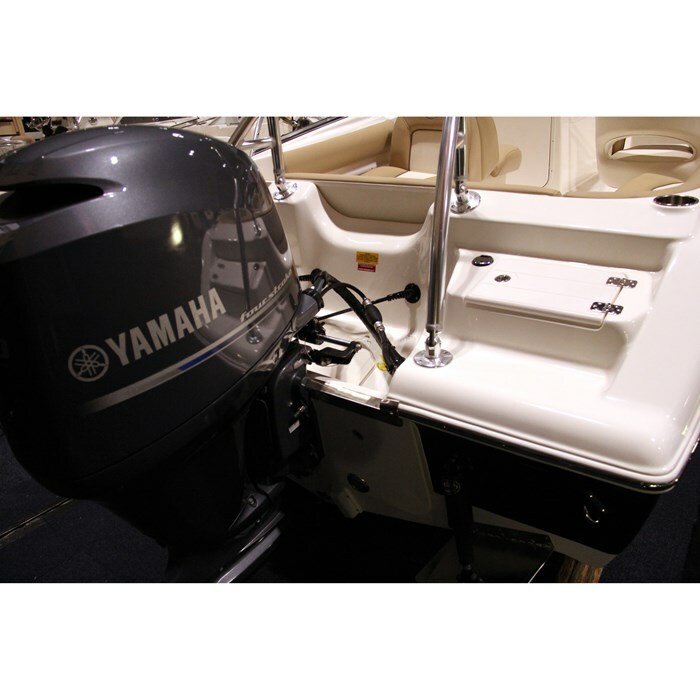 Maximum 200 horsepower single outboard power is available for the 203 DFS and factory recommended power is 115 to 150 horsepower. Fishing? Cruising? Watersports? Family boating fun? The Key West 203 DFS certainly would seem to have all of the above very much in its sights.